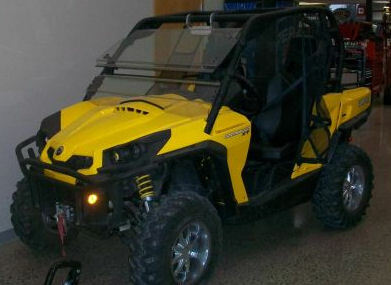 The 2011 Can Am Commander for sale is a yellow, barely USED 2011 CAN AM COMMANDER XT 1000 THAT HAS A 4000# WINCH, FUEL INJECTION V TWIN 85 HP ENGINE, ALUMINUM VISION RIMS AND GRIM REAPER TIRES, SPLIT WINDSHIELD AND REAR SCREEN, TILT STEERING, DUMP BOX AND LOW MILEAGE OF ONLY 626 MILES. LOTS OF EXTRAS AND A FINE MACHINE FOR MY CHEAP ASKING PRICE! To ask questions about the Commander or any of the accessories in the above list, contact me using the space below that has been provided by Strike Lightning's GoGoCycles Used Motorcycles for Sale (and PLEASE do not neglect to include your contact information in your email or to provide a phone number or email address!) so that I can respond with answers to your questions or after consideration of your best offer as quickly as possible. You won't find a nicer used Can Am ATV for sale on Craigslist or in an Ebay auction so hurry and make an offer before it gets away from you! Strike Lightning would also encourage bikers to submit a review of the 2011 Can Am Commander to make the biker community aware of any problems that are commonly associated with the 2011 model can AM or to highlight its positive features and help potential buyers make informed decisions. The Can Am commander has barely been used and my asking price is $$10,900 plus tax and transfer fees which is a really good price so email me, Warren, today and don't forget to mention that you found this ad on Strike Lightning's Motorcycle Classifieds www.gogocycles.com.